When the State of Illinois enacted its budget for the current fiscal year in June 2018, it had a narrow surplus on paper of about $14 million. But a new report from the Governor’s Office estimates that the State’s actual financial result for FY2019 will be a budget deficit of more than $1 billion—a gap that could widen to $2.8 billion the following year without policy changes. The projected outcome in FY2019 is not a surprise, given concerns expressed last spring that the budget was based on aggressive assumptions. In fact, the latest numbers no longer include revenues from the long-anticipated sale of the James R. Thompson Center in Chicago. Additionally, the new projections include payments not accounted for in the budget for union wage increases withheld by the State since the end of FY2015. The projected deficit also reflects less interfund borrowing in FY2019 than originally projected. The Governor’s Office of Management and Budget (GOMB) continues to count on most of the savings that were budgeted from new pension buyout plans in FY2019. However, the buyout plans have not yet been implemented, and the report cautions that the State “can provide no assurance as to the amount of savings actually realized from the implementation” of the buyouts. The latest projection means that Illinois’ backlog of unpaid bills is expected to reach $7.8 billion in June 2019. That compares with a current backlog of $7.4 billion and $6.8 billion in unpaid bills at the end of FY2018. The following table compares GOMB’s estimated general operating funds results for FY2019 with the enacted FY2019 budget. As required by State law, the new report was accompanied by a five-year budget forecast. The forecast shows the deficit rising to $2.8 billion in FY2020 and remaining at more than $3 billion each year through FY2024. The backlog of unpaid bills increases from $10.6 billion at the end of FY2020 to $23.7 billion in FY2024. However, the numbers for FY2020 and beyond do not incorporate any policy changes. GOMB noted that future fiscal policies will be proposed by Governor-elect J.B. Pritzker, who will succeed Governor Bruce Rauner in January 2019. GOMB projects General Funds revenues—before interfund borrowing—of $37.6 billion in FY2019, a decrease of $135 million from budgeted revenues. A projected increase in receipts from incomes taxes and other sources is partly offset by lower federal revenues. The new estimate no longer includes the sale of the Thompson Center. When the FY2019 budget was enacted, the State forecast a sale price of $300 million, offset in the first fiscal year by $30 million in expenses. However, the legislation authorizing the sale, passed by both chambers of the General Assembly in 2017, has been held on a motion to reconsider and has yet to be presented to the Governor for signature. The legislation will expire when the 101st General Assembly begins in January. Accordingly, the Governor’s Office has removed $300 million of revenues from the FY2019 projection and has not placed them in any subsequent year of the forecast. GOMB’s estimate for FY2019 assumes a reduction in interfund borrowing from the $800 million authorized by the General Assembly. Officials said balances in other State funds can support a maximum of only $400 million in interfund borrowing. After accounting for the reduction in interfund borrowing, total FY2019 revenues decline by $535 million, or 1.4%, to $38.0 billion in the latest estimate from $38.5 billion in the enacted budget. The projection of future revenues also reflects a change. In past years’ forecasts, GOMB factored the possibility of a recession into a blended revenue forecast. The current forecast instead contemplates a specific recession from the fourth quarter of 2019 to the second quarter of 2020. As a result, forecast income tax revenues grow by only 2% to 3% in FY2020 and FY2021, then more quickly in later years. Total revenues (excluding interfund borrowing) grow by only 2.1% annually over the five-year period, from $37.6 billion in FY2019 to $41.5 billion in FY2024. Projected General Funds spending of $39.0 billion in FY2019 is $526 million above the budgeted level of $38.5 billion. The main reason is that the FY2019 budget did not account for any payment of step increases to thousands of members of the American Federation of State, County and Municipal Employees (AFSCME) under their last contract, which expired at the end of FY2015. An appeals court ruled in November 2017 that the State violated the law when it ended the automatic annual increases for early-career workers, and the Illinois Supreme Court in March 2018 declined to hear the case. However, the Rauner administration has maintained that it does not owe anything after January 2016, when it declared an impasse in contract negotiations. The issue is now before the Illinois Labor Relations Board, which is weighing both whether an impasse occurred and how much step pay is owed. The latest estimate of FY2019 spending includes step payments of $200 million for the current year and $300 million for prior years. GOMB said that $500 million is a maximum figure and that the actual payment could be as low as $170 million, depending on the labor board’s final rulings. The five-year forecast also includes step increase payments of more than $200 million annually through FY2024. 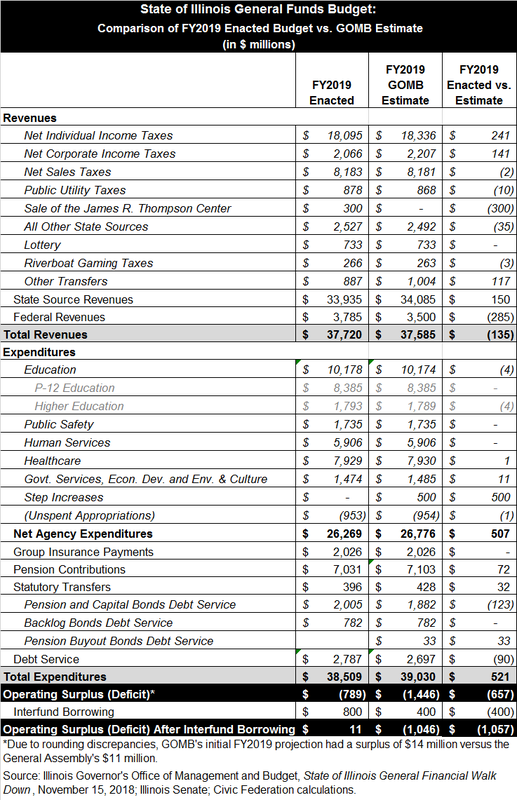 As discussed here and here, the FY2019 budget assumed $445 million in savings on State pension contributions, mainly due to new pension buyout plans. The Teachers’ Retirement System (TRS) and State Employees’ Retirement System (SERS) have said they plan to start offering the buyouts in December 2018 or January 2019, but the State Universities Retirement System (SURS) has indicated that the plans will not be fully implemented until after the end of FY2019. As a result, GOMB’s forecast shifts the $70 million savings on SURS contributions originally budgeted for FY2019 to FY2020. In addition, actual State contributions for TRS and SERS will not be known until they recalculate the required amounts before the end of FY2019. In FY2020 General Funds pension contributions are projected to increase by $1.1 billion, or 15.3%, to $8.2 billion from $7.1 billion in FY2019. Except for the SURS shift explained above, the FY2020 amounts projected by GOMB reflect the State contributions recently proposed by the retirement systems. Although TRS included savings due to the pension buyouts, SERS and SURS did not. SERS, the pension fund that had been assumed to generate the largest savings, said it had no basis to estimate the impact of the plans without any actual experience about members’ participation. To finance payments to members who select buyout options, the forecast assumes the State will issue $1 billion of bonds at 6% interest in March 2019. The bond sale is expected to result in additional debt service of $90 million to $99 million annually during the five-year period. GOMB projects that General Funds spending will rise by $1.6 billion, or 4.1%, in FY2020 to $40.6 billion. Besides increases in step payments and pension expenses, the FY2020 forecast is based on additional elementary and secondary education spending of $350 million to meet the annual target increase of $350 million specified in education funding reform legislation enacted in August 2017. Medicaid spending is expected to increase by $397 million in FY2020, partly due to decreased federal reimbursements under the Affordable Care Act’s eligibility expansion and reduced cigarette tax receipts. By FY2024 General Funds expenditures are projected to climb to $44.7 billion. After accounting for both interfund borrowing and step payments, GOMB projects a budget deficit of $1.0 billion in FY2019. Without policy changes, the projected deficit rises to $2.8 billion in FY2020 and stands at $3.2 billion in FY2024. This task will fall to the new Governor-Elect, whose budget proposal for FY2020 is due on the third Wednesday of February, according to the State Budget Law. The scheduled date would be February 20, 2019, unless the General Assembly approves a delay. Although Governor Rauner presented his four budget proposals on time, his predecessors were granted numerous delays, including a reprieve of nearly two months for then-Governor Rod Blagojevich’s first budget, which was issued on April 9, 2003.